” Help Stop Animal Cruelty Adverts contribute towards site running costs, but currently may not fit with the site ethos. We will continue to work on a solution. If you feel helpless about not being able to help stop animal cruelty, do not despair! There are numerous ways you can help, many of which you may never have realised. You can find them all by clicking the last option on the purple contents box. No matter what your personal circumstances, or the type of things you like doing, there is something for everyone. You don’t even have to move from your computer or smart phone if you don’t want to. If you enjoy being around other people and/or animals, there is lots you can do in that respect too. To be most effective in your efforts to help animals, it is advisable to arm yourself with the knowledge you will need. You can find information about Types Of Animal Cruelty, here. Please be aware that there are some upsetting information and images. You can make sure you know how to care for your mind and keep yourself strong here. Image: Because animal cruelty is a horrible subject, people find it easiest to bury their heads in the sand. This non-action actually helps abusers, allowing them to continue unchallenged and unhindered. It is easy to feel overwhelmed by all the animal cruelty happening in the world, and feel helpless to change it. 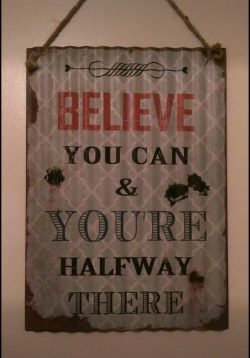 Some people say that because they can only do a little, there’s no point in them doing anything. If we all had that attitude, nothing would ever change for animals. When we each do the little that we can, together, a lot is achieved. 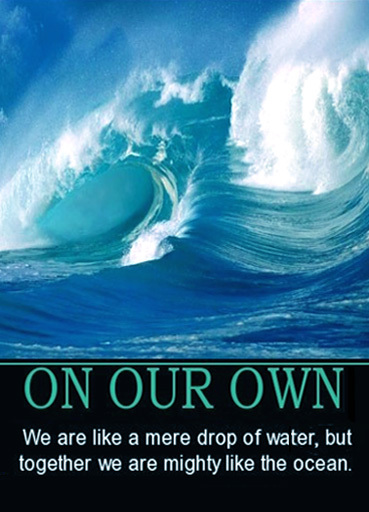 Image: Think how much power the ocean has – together we are that ocean. An enormous amount of progress has been made in regards to the treatment of animals. This is ONLY because of the number of people doing what they can to improve things. Image: There was a time when the majority of people thought concepts such as the abolition of slavery was a ridiculous and unrealistic idea. As human minds evolve, the cruel exploitation of animals for human gain will one day be seen in the same way issues such as human slavery are seen today. All the issues in the image below began with people who felt strongly about them, like we do about animal abuse. It is natural to feel angry and upset about the animal cruelty you want to stop. Try to use those feelings to drive you on in the fight to stop the cruelty. Turn your outrage into action! After all, only action will change things. 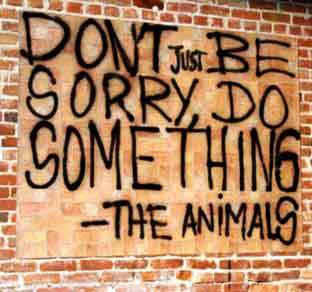 It is natural for you to feel overwhelmed and completely floored by animal cruelty, but take the time to gather yourself up again and take action. Dwelling on how horrifically animals are treated won’t do any good. It won’t change anything for animals and it will weighyou down, preventing you from being able to do anything to help animals. Only doing something about it will make a difference. The worst thing you can do for the animals is turn away and do nothing. 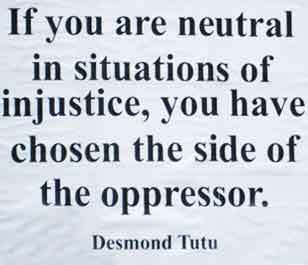 Remember, inaction helps the abusers carry on causing animal suffering, unchallenged and unhindered. There are so many ways to help animals in this section of the site, you will find something right for you on one of the pages. In order to be of help to animals, you must look after your mental health. If you feel animal rights activism is getting you down, take a break. Some people find helping animals therapeutic and find that it helps them. With others, it may break them. If it is crushing your spirit but you still feel you must help animals, look at a different way to help, that may cause you less distress. Spending time with other people who have the same values as you, and who are also working towards a better world for animals, is good for your mental health. In turn, it is good for animals, because you cannot help animals without sound mental health. 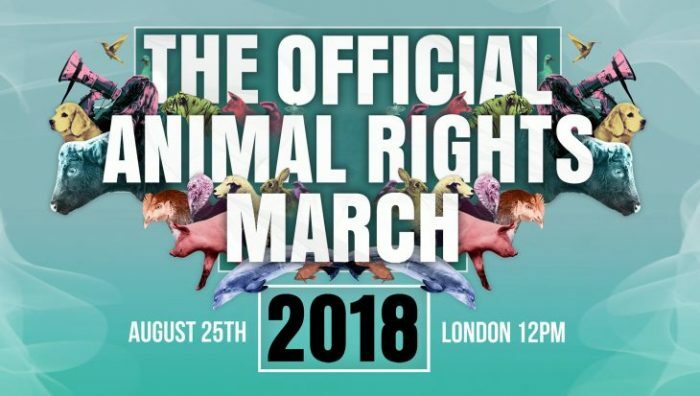 Look online, including on social media sites, to see if there are any animal rights or vegan groups near you. You can speak to them about your feelings and get support. It does not matter what age you are, if you are an introvert or extrovert, whether you don’t have much time or energy, whether you are good with people, animals, or prefer your own company, whether you like to stay in or go out, whether you are in good health or not – there are ways to help on the list below that suit every type of person who is interested in helping save animals from cruelty and suffering. Image: It is easier to turn away from such a painful subject and pretend it is not happening, but that only allows animal abuse to continue. We can save them, but only with action. 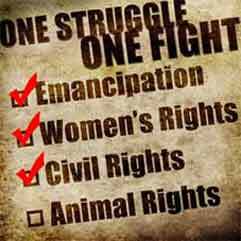 Below are a list of pages showing ways you can help stop animal cruelty and suffering. Click on the links to be taken to the pages. Doing anything in the pages on this list contributes to helping stop animal cruelty and suffering. The more of the things you do, the more you will be helping. If you can only do a little, don’t ever think it is not worth it, as the animals need every little tiny bit of help they can get, and together it adds up to a lot. 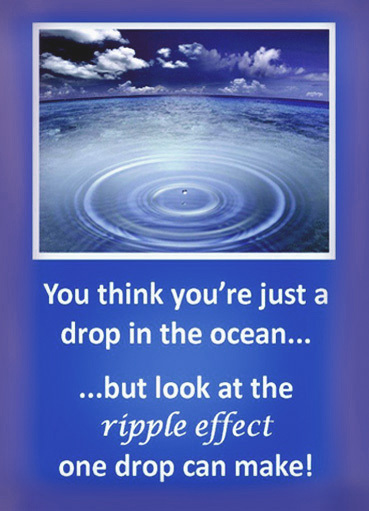 Image: Remember the ripple effect one drop in the ocean can have. Page Description: The internet offers numerous ways you can either earn/raise funds for animals for free, help find homes for animals, or rescue spaces to save the lives of pets on death row, help raise awareness of the issues, or help animals in many other ways. You can play games on the web, use apps, social media, and more. Page Description: Make a big contribution to helping stop animal cruelty & suffering by being a cruelty-free consumer. Find out which companies are and are not cruelty-free by choice, learn what ingredients to avoid to prevent destroying the habitat of wildlife, and find out how else you can be a cruelty-free consumer. Page Description: The most effective way to help stop animal cruelty is not to fund it. Most people finance animal torture and death, often without even realising it. Find out if you are inadvertently doing it, and how to avoid it on this page. Page Description: There is a lot of evidence of people being cruel to animals on the web. People post videos and pictures of animal abuse online and, disturbingly, some people actually enjoy viewing them. Just getting the abuse taken down means the evidence is lost and nobody will be prosecuted. This page will tell you what to do in order to get it investigated with the aim of bringing the people responsible to justice. Page Description: Save abandoned animals lives by cross-posting / sharing them online, such as on social networking websites like Facebook and Twitter. Many animals lives are saved this way as it finds them life-saving rescue spaces. Page Description: Email campaigns, social media campaigns, and petitions can be hugely successful. Success is often due to ongoing pressure being applied using different approaches, such as campaigns & petitons, protests, the spreading of awareness, and people closing their wallet to cruelty. Find links to email campaigns, social media campaigns, and petitions on this page. There is advice about which petitions may be most effective, and fake petition sites to avoid. Also find ways to get petitions automatically filled in, meaning you avoid having to type in your details each time. Letters and phone calls are also a useful way of taking part in campaigns and petitions. Page Description: Charity search engines donate money to the charity you select every time you use them to search the web. Using them, you can earn money for animal charities without even noticing. Choose the best charity search engines from this page and find out how to make one your home page instead of your current search engine. Page Description: While on the web, take a few seconds to visit click to donate websites where you simply click a button to earn money for animal charities. You can also earn money to help animals by doing online activities and playing online games. This page gives you access to all these. Page Description: You can easily set up an internet fundraising page to help raise funds for animals in desperate need. It is probably most effective to have a fundraising group page on a social networking site such as Facebook. Such pages that are already established are often in need of people to help run them too. You can run sales, auctions, or other events on it to raise money for animal charities. Page Description: To help stop animal cruelty you can donate things in good condition to animal charities that they can sell in their charity shops, at fundraising sales, on online auctions, or use as prizes for things such as tombolas and raffles. You can also donate items animal rescues can use in the care of their animals. Some can even use damaged clothes, fabric scraps, wool and buttons which they recycle into fundraising items. De-clutter your home to help animals. Page Description: You can help prevent pets being abused & tortured by warning people of the horrifying dangers they are unwittingly putting their pets in by advertising them for re-homing, whether they advertise them free to a good home or for a small fee. You will also find advice to give people on safer re-homing. Page Description: Protests and demonstrations put pressure on organisations to stop their animal exploitation and abuse, and ongoing or repeated protests are commonly successful. Protests also draw attention to animal cruelty issues, embarrassing the perpetrator and gaining support from the public. They can also deter customers of the organisations. Different protest tactics are explored on this page. Page Description: Find out how you can help stop animal cruelty by using the “eBay for charity” option on the eBay auction site. There, you can sell new or used items and can choose for between 10% & 100% of the money to be donated to the charity you select. You can also help by buying items sold in aid of animal causes. Page Description: There are many easy, low-cost ways you can go about fundraising for any animal charity you want. This page explores lots of different fundraising ideas you can do for low cost or no cost. Page Description: If you enjoy sewing, knitting, or arts and crafts, use your hobby to benefit animals in need. Page Description: See how to recycle your old Christmas cards, other greetings cards, gift tags and wrapping paper, into new cards, gift tags and other creations, and where you can donate them so they help stop animal suffering. Page Description: If everyone bought greeting cards, gifts, and other goods from struggling animal rescues & charities, instead of regular retailers, an enormous number of animals would be saved from suffering. The sad reality is that most people do not. There are links to animal rescue/charity fund raising stores on this page. Page Description: By donating a car or other vehicle, whether it is to be scrapped or not, you can help stop animal cruelty. The vehicle will be collected from you for free. More information on this page. Page Description: By taking out pet insurance with companies that donate large amounts to animal charities, you will be protecting yourself and your pet from unexpected vets costs, whilst raising money for animal charities at no extra cost to you. Find out on this page which pet insurance companies most help animal causes. Page Description: Tax donations are a big help to charities and do not cost you anything extra. There is an option on UK donation forms to ‘Gift Aid’ your donation. This means you have the option for the tax on your donation to go to the charity rather than the Government. Another way of making sure the charity receives your tax instead of the Government is by donating using ‘Payroll Giving’, where you donate money before it is taxed. More information on this page. Page Description: To vastly reduce the numerous innocent, unwanted pets being put to death in pounds, shelters & some rescues every single day, it is vital to spay and neuter pets. It also protects your pets from cancers of the reproductive systems. Information on this page includes when you should neuter, the effects of neutering, myths about neutering, low-cost neutering available, plus more. Page Description: Information about saving innocent animals lives by sponsoring, fostering or adopting them. Also find rescues across the UK & US and what pets they have available to foster, sponsor, or adopt. Plus a look at so-called dangerous dogs & overlooked shelter pets, at the suffering bad breeders and puppy farms cause, and at the fate animals advertised in free to good home adverts can so easily meet. Page Description: Being an animal volunteer at a charity or rescue is a huge help to animals in need. Charities and rescues are usually desperate for reliable volunteers. There are often many different roles available – more than many people realise, doing much more varied things. Some involve direct contact with animals, some don’t. Many of these roles are explored on his page. Have a look to see if any interest you. Page Description: A huge number of people do not know how badly animals are abused across the world, or even in their own country. Neither do they how each person’s choices in life cause the suffering. You can help stop animal cruelty and suffering by raising awareness of it. You can do this by spreading information (such as what you se on this site) on the web, using leaflets, flyers, posters, your voice, displaying messages on your clothing and accessories, and in other ways. See this page for more information. Page Description: Fox hunters seem to enjoy causing excruciating pain to foxes by ordering their dogs to chase these terrified animals until they cannot run anymore & then rip them apart, even where it is illegal. Learn on this page how to be a hunt saboteur so you can save foxes from this cruelty. Where it is illegal you can even get fox hunters prosecuted. Page Description: A website is very important for an animal rescue or charity. Any rescue or charity without one is at a distinct disadvantage. It is likely their animals will not be re-homed as quickly, and that means there will be fewer rescue spaces available for death row animals in pounds. You can help save many animals lives by creating for free, and/or running an animal rescue website for an animal charity or rescue in need of one. Further information is on this page. Volunteers are often needed to do this and these can be in short supply. If you write about the animals and share photos and videos regularly, it is a very effective way of engaging people, gaining support, spreading awareness, and helping re-home and save more animals lives with the rescue spaces you help free up. Page Description: By doing your shopping online through fundraising websites, you can raise money for animal charities. There is no cost to yourself, as the retailer you purchase from makes the donation. Thousands of different well-known retailers and are registered with these fundraising sites, as well as thousands of charities. Get access to these fundraising shopping sites, and information about them, through this page. Page Description: Among other things, this page looks at vegetarian and vegan living. Having a vegan lifestyle is the kindest thing you can do for farm animals, with being a vegetarian coming second. There are many health benefits, including a reduced risk of cancer. Page Description: By including animal charities in your will, you will be safe in the knowledge that you will continue to help stop animal cruelty, even after you have gone. Without such legacies willed to them, animal charities and rescues cannot survive. Page Description: Many health research charities use cruel tests on animals, but there are many others that do not. 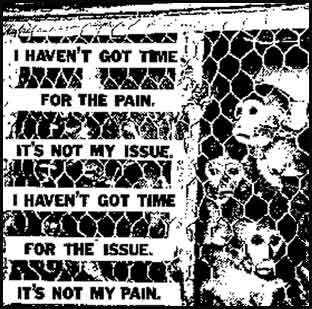 Help stop animal cruelty by only supporting research charities that use alternative methods to animal testing. Find out who does and does not test on animals on this page. You may be surprised! Page Description: Animals involved in tourism often suffer very much. Find out how you can make sure you avoid funding the industry. Page Description: You can help reduce animal testing AND increase the safety of new medicines by helping researchers do human-specific medical research. This simply involves a donation of your redundant body tissue left over from operations/births, etc, or organs after your death. Page Description: Learn about direct action, and how animals rights groups encourage both legal and illegal methods, earning some the the label of extremists and terrorists. See how throughout history people who undertook illegal direct action in the name of other causes are now celebrated as brave heroes. Page Description: The food industry is full of secrets they are desperate to keep from consumers. You will be amazed at just how many of these food industry secrets you did not know until now. Help animals by sharing this page on social media. Page Description: Here you will find the contact details of some useful organisations that you may find helpful in your fight against animal cruelty & suffering. Page Description: A few examples of how visitors to this site are contributing towards stopping animal cruelty. Page Description: On this page you will find links to all the ways there is on this site to help stop animal cruelty and suffering. Image: An example of an animal rights activist event.